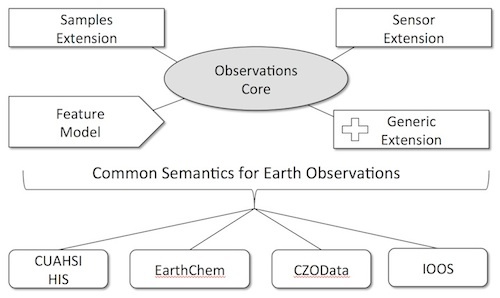 ODM2 is an information model and supporting software ecosystem for feature-based earth observations, designed to facilitate interoperability across scientific disciplines and domain cyberinfrastructures. For example, a single ODM2 database can readily integrate diverse types datasets such as: hydrological time series, soil and sediment geochemistry, biodiversity surveys, oceanographic sensor profiles, multi-dimensional spectra, and more (Horsburgh et al. 2016). ODM2 was developed with extensive community input by integrating and enhancing concepts from ODM1 (from CUAHSI Hydrological Information System), IEDA PetDB & SedDB and other existing information models. ODM2 is a profile of Open Geospatial Consortium's (OGC) Observations and Measurements (O&M) standard. ODM2 metadata structure provides a powerful new way to describe sampling, sensing, and analysis workflows. A flexible Sampling Feature extension tracks relationships in nested hierarchies of sampling sites (weather stations, stream gauges, soil pits, wells, bore holes, etc. ), field specimens (rocks, cores, soils, water, gas, plants, etc. ), and lab specimens (i.e. subsamples, fractions, powders, extracts, digests). This extension is fully compatible with OGC O&M Sampling Features and International Geo Sample Numbers (IGSN).The ability to record Actions (e.g., sensor deployments, specimen collection, lab analyses), relationships between Actions, People that perform them, the Methods and Equipment that are used, and their Results and Values of many types. Object-Relational-Mapping translates entity types to a class-subclass structure that enables inclusion of domain-specific attributes. ODM2 can also facilitate interpoerablity in distributed cyberinfrastructure that use a services oriented architecture (SOA, Figure 1). SOAs are most effective when the data Storage, Catalog, Client and Transfer components of an SOA all use the same information model for requirements and semantics. ODM2 was designed to serve all of these functions, with the vision for a future SOA designed around ODM2. Visit the ODM2 GitHub Organization for information and downloads of the entire ODM2 software ecosystem. Visit the ODM2/ODM2 GitHub repository to access blank schemas for relational database implementations and scripts for populating controlled vocabularies. View documentation for ODM2 for a more detailed description of the information model and it's features and functionality. Have a look at the ODM2 paper in Environmental Modelling & Software. It's open access! Data capture is a critical point in the data life cycle. 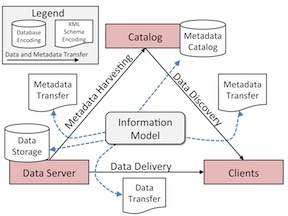 We are developing software tools to support, aid, and encourage reliance on the ODM2 information model during data collection and analysis to ensure that the information model enhances scientists’ ability to work with data during analysis and at the same time capture metadata critical for later sharing and publication. Software we are developing includes the following list. A more comprehensive and descriptive list is available in the documenation within the ODM2 GitHub repository. Vist the ODM2 GitHub repositories to contact us or to submit issue or feature requests. This material is based upon work supported by the National Science Foundation Grant EAR 1224638. Any opinions, findings, and conclusions or recommendations expressed in this material are those of the author(s) and do not necessarily reflect the views of the National Science Foundation. www.odm2.org is maintained by the ODM2 Team. This page was generated by GitHub Pages using the Cayman theme by Jason Long.